Uber’s “flying car” project Elevate came whizzing back into view today with a number of key announcements about where it will first appear, who will be working on it, and how this futuristic service will look when it ultimately takes off. In a speech at the Web Summit in Lisbon today, Uber’s head of product Jeff Holden announced that the company is adding a third city, Los Angeles, to its list of places where it hopes to pilot its aerial taxi service by 2020. LA joins Dallas-Fort Worth and Dubai as cities announced to be working with Uber on the program. Holden also said that Uber has signed a Space Act Agreement with NASA to create a brand-new air traffic control system to manage these low-flying, possibly autonomous aircraft. And to round it all out, Uber released a glossily produced video to demonstrate what using its aerial taxi service would look like from the perspective of a working mom who just wants to get home to her kids. As you can see, it’s all very utopian. A passenger books the flight through her Uber app, and then ascends to a “skyport” on the roof of a nearby building. She badges through a turnstile using her smartphone — security is non-existent in this futuristic vision — and is briefly weighed to make sure she’s not too portly for Uber’s weight-conscious flying taxis. How much closer? Uber first introduced its plan to bring ride-sharing to the skies in a white paper last year, but the project still faces significant hurdles. The kind of aircraft Uber envisions shuttling passengers from rooftop to rooftop — electric, autonomous, with the ability to take off and land vertically (also known as VTOL, pronounced vee-tol) — don’t exist yet, nor does the infrastructure to support such a vehicle. Experts suggest that engineering and regulatory hindrances will likely prevent flying cars from ever taking off in a meaningful way. Which is not to say flying cars aren’t having a moment. At least 19 companies are developing flying-car plans. These include legacy manufacturers like Boeing and Airbus, and small startups like Kitty Hawk, owned by Google founder Larry Page. Meanwhile, Uber has made significant strides in partnering with a handful of aircraft manufacturers, real estate firms, and regulators to better its chances of developing a fully functional, on-demand flying taxi service. It held a day-long conference on the project in Dallas in April. And Holden says more alliances, especially with manufacturers, will be announced in the future. Holden said that Uber wouldn’t have to wait for 2020 before it starts testing things out IRL. The company aims to begin operating a fleet of low-flying helicopters around Dallas-Fort Worth Airport — while working with air traffic controllers to not encroach on their flight paths — as a way to test NASA’s UTM system. The agreement won’t involve any money transfers, but it will allow Uber and NASA to trade technology and expertise. The ride-hail company already poached Mark Moore, a NASA veteran and VTOL expert, to help run its Elevate project. The city’s elected officials have signed off, though Uber says it will conduct community meetings to hear resident concerns about noise, pollution, and access. 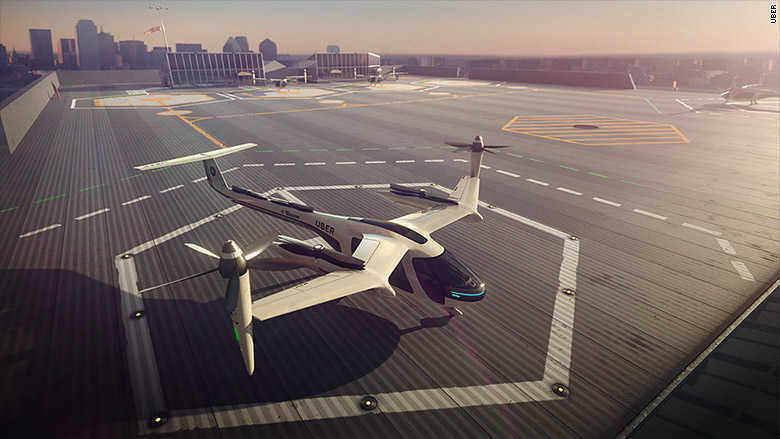 Much like it did in Dallas and Dubai, Uber has signed an agreement with a local landlord, Sandstone Properties, to develop rooftop launch pads for its VTOL aircraft. The company predicts a one-and-a-half hour car journey from LAX to the Staples Center could take less than 30 minutes using a combination of flying cars and regular cars. “LA is the perfect testing ground for this new technology, and I look forward to seeing it grow in the coming years,” said Mayor Eric Garcetti in a statement provided by Uber. The jury is out on whether an urban VTOL system would make an appreciable contribution to a next-generation transportation system, or whether it would simply be an escape hatch for the super rich to avoid street-level congestion. Holden argued that if the latter were true, Uber wouldn’t be pursuing this project. Holden predicts that fares will be so low, it will actually be cheaper to fly with Uber than own your own car. And if that sounds familiar, it’s because it's long been the company’s mission to bring about the end of personal car ownership. An aerial taxi service would just be another tool in the toolkit toward that end. When you step back and look at what Uber is proposing, it’s truly staggering. Tens of thousands of flights per day. Electric, autonomous aircraft buzzing from rooftop to rooftop. Trips costing as little as $20. It’s fairly blue-sky thinking, even for a company that regularly imbibes its own Kool-Aid. 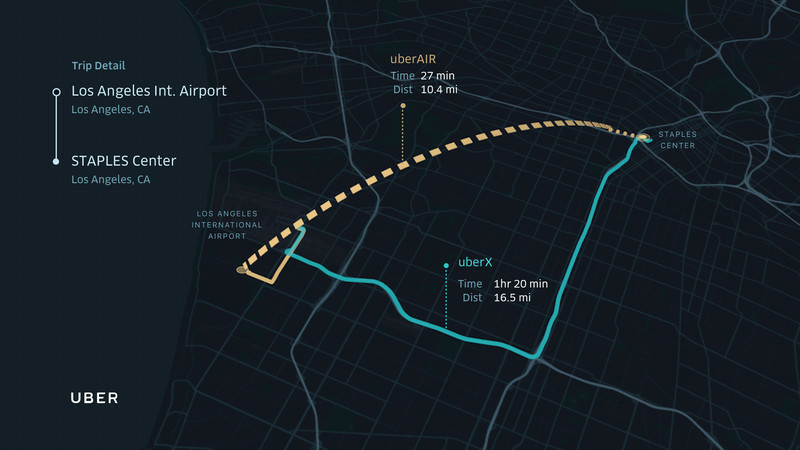 The runway isn’t clear yet, but Uber is convinced its path forward will be free of turbulence.